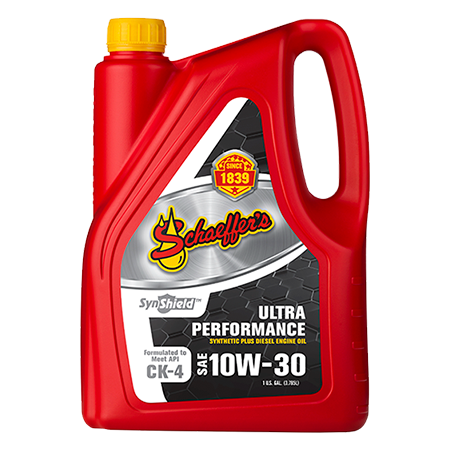 SynShield® Ultra Performance 10W-30 Engine Oil is a premium advanced performance, synthetic plus, heavy-duty diesel engine oil formulated to provide maximum protection against wear, oxidation, deposit formation, soot contamination and aeration. SynShield® Ultra Performance 10W-30 Engine Oil is built for on-highway and off-highway applications subjected to severe stop-and-go, excessive idling, short haul and/or severe duty operating conditions. Using our proprietary friction modifiers, Micron Moly® and Penetro®, SynShield® Ultra Performance 10W-30 Engine Oil creates a slippery, tenacious shield that prevents metal-to-metal contact for increased engine durability and efficiency. SynShield® Ultra Performance 10W-30 Engine Oil is suitable for use in 2007 and 2010 emission compliant engines that utilize heavy exhaust gas recirculation (EGR) and exhaust after-treatment devices such as diesel particulate filters (DPFs) with or without diesel oxidation catalysts (DOCs) and selective catalytic reduction (SCR). SynShield® Ultra Performance 10W-30 Engine Oil can also be used in low-emission certified diesel engines that are equipped with EGR, older non-EGR containing diesel engines, and off-highway diesel engines. Improved wear protection – 85% less wear than conventional CJ-4 oils. Strong soot-busting, deposit-dispersing capability – 77% greater soot handling than conventional CJ-4 oils.